Every year, themission GWG Awards are presented to websites that "showcase excellence" in their field. The announcement of the winners is always highly anticipated in digital circles, creating a stir on social media as the date approaches. With entries from well-established household brands to grass root startups, and a judging panel of seasoned digital experts, the decision-making was never going to be easy. On Monday 12th November, shortlisted sites, friends of The GWG and themission, headline sponsor, gathered to hear Aron Gelbard, co-founder of Bloom & Wild, the world’s leading flower gifting brand, announce who had made the cut. The judging panel, including Holly Tucker, co-founder of gift site, Not On The High Street, Kelly Eastwood of The London Chatter and Jerry Horwood, serial entrepreneur, among others, assessed entries on the quality of design, usability, content and product or service evident within each site put forward. After much deliberation, Great British Chefs was crowned Website of the Year 2018. Great British Chefs is one of the fastest growing food websites in the UK, a go-to destination for foodies in search of recipe inspiration, technical expertise and the latest chef and restaurant news and reviews. On presenting the award, Aron Gelbard commented: "Great British Chefs is a brilliant website - it combines a large volume of easy to find information, combining recipes and content thematically and delighting users through usability and careful use of video, with rapid load speeds, performance and mobile optimisation." Head of Marketing & Social Media, Mecca Ibrahim responded by saying: "Winning the 2018 Website of the Year Award is an amazing experience! A few years ago, we won the GWG People's Choice Award which was great too. It is nice to be back in this beautiful room among other sites that we recognise and value. We are good friends with quite a few of the other sites such as Lizzie Loves Healthy and Sheerluxe and it's been a great evening to meet other people and network." New for 2018, recognising mobile, Touchnote was declared App of the Year 2018. This multi-award-winning mobile and desktop app turns your pictures into gorgeous postcards and gifts, in very simple steps. This year, Lizzie Loves Healthy wins People's Choice, with Lizzie's fans reacting brilliantly to her call out on Instagram, when the number of votes rocketed up. The blog is full of deliciously easy, nutrient packed recipes that everyone can feast on, with tips and tricks on how to keep families happy and healthy. On winning the award, Lizzie King, founder, said: "Winning the People's Choice Awards means a lot to me as it shows that people care. My site is about keeping people healthy, fed and happy. Winning this means so much to me." Other category winners included Gaest, Northern Europe’s largest online marketplace for listing, discovering and booking meeting spaces; Sheerluxe for your daily fashion and lifestyle fix; House & Garden for interiors inspiration; London Art Studies, the educational art site that helps you learn your Monets from your Manets. To see the full list of category winners, click here. 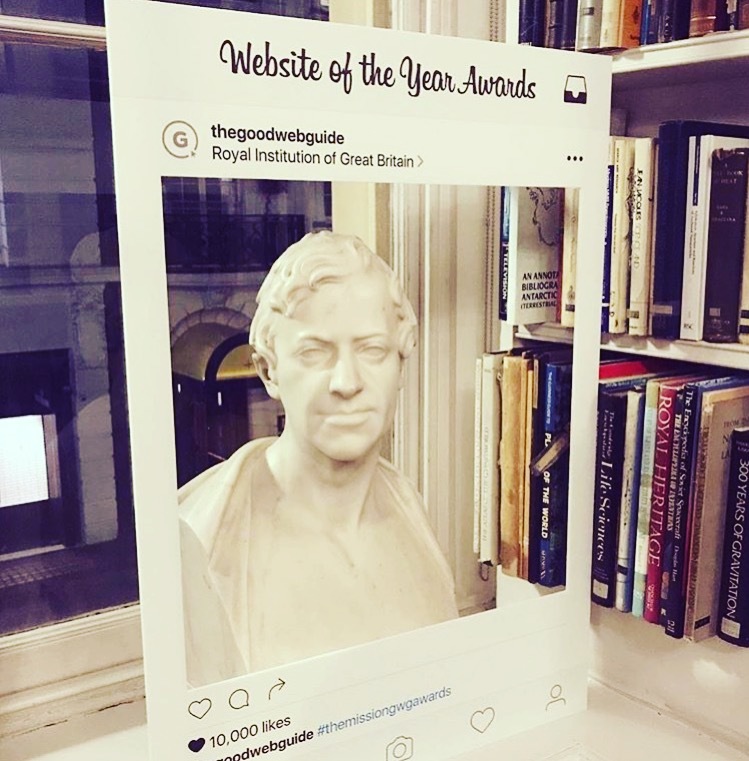 • The winners were announced at an evening reception at the Royal Institution of Great Britain, Albemarle Street, London W1 on Monday 12 November 2018. Aron Gelbard, co-founder of Bloom & Wild, announced the winning sites. • Category sponsors and partners included Office Freedom, Streets ISA Chartered Accountants, The House Directory, re:Signal, Zest Digital. • The winning site takes home a number of prizes to boost their online presence. The GWG offers its visitors a more taste driven and selective alternative to search engines whilst also championing small web-based businesses. Editorially driven with detailed reviews on websites and snappy web-related features, The GWG has grown its online presence with initiatives such as the extremely popular Guest Edited newsletters and the annual Website of the Year Awards, all enabling The GWG to become the definitive authority on everything that is good about the web. This press release was distributed by ResponseSource Press Release Wire on behalf of The Good Web Guide Ltd in the following categories: Children & Teenagers, Entertainment & Arts, Health, Leisure & Hobbies, Home & Garden, Women's Interest & Beauty, Consumer Technology, Food & Drink, Business & Finance, Travel, Education & Human Resources, Media & Marketing, Retail & Fashion, for more information visit https://pressreleasewire.responsesource.com/about.